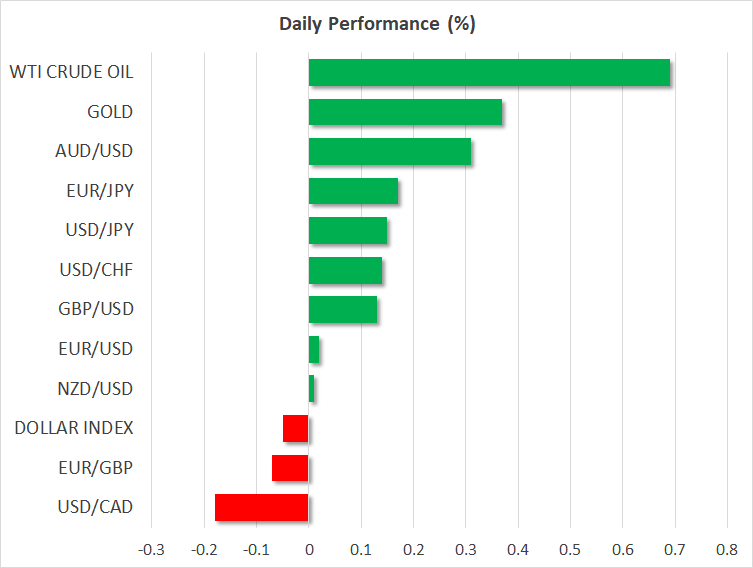 The greenback shined for yet another session, continuing its unrelenting rally for an eighth day in a row versus a basket of major currencies, without much in the way of news flow behind the move. Traders seem to be having second thoughts about the likelihood of a US-China trade deal this month, and in their search for a hedge are turning to world’s reserve currency, which has been the safe haven of choice throughout the trade dispute. Beyond that, the dollar’s latest gains also seem owed to investors staying away from other major currencies, most notably the euro and pound amid European growth concerns and Brexit uncertainties respectively. In other words, the US – and by extent its currency – remain a ‘decent house in a bad neighborhood’. Can this rally continue? A lot will likely depend on what signals come out of the trade talks later this week, though admittedly, the speed and magnitude of the latest gains suggest some cause for caution in the immediate term. Today, the greenback will likely take its cue from Fed Chairman Powell, who will deliver remarks at 17:45 GMT. He has clearly shifted to a more dovish stance, and it will be interesting to see whether more “cautious” rhetoric can erode some of the dollar’s recent appeal. After closing little changed on Monday, US stock markets seem set to open notably higher today, according to futures. Asian indices are also in the green for the most part, while the traditional safe haven, the Japanese yen, is the worst performer in the G10 FX sphere today.